Mount Lemmon is a famous “sky island” with an elevation of 9,157 feet. 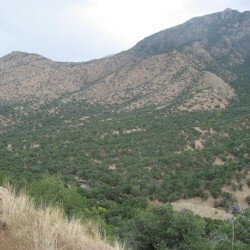 The overall climate is very different from that of the surrounding desert area. Located in the Coronado National Forest, it is the home of Ski Valley the town of Summerhaven, and is the site of an astronomical observatory. 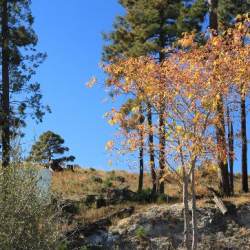 The Coronado National Forest consists of Five Ranger Districts and a Supervisor’s Office. One District office is located in each of the following Southern Arizona Communities; Douglas, Nogales, Safford, and Sierra Vista. 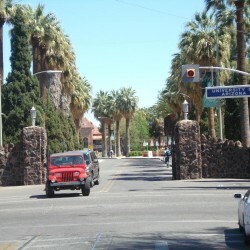 The Santa Catalina District office is located in Tucson as is the Supervisors Office. 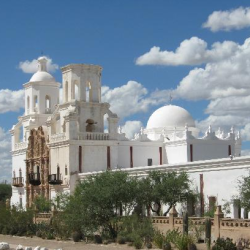 Built in the 1700s, this recently restored white adobe church, representing a wonderful example of Spanish colonial architecture, is beautiful inside and out, with colorful frescoes, sculptures, and carvings.